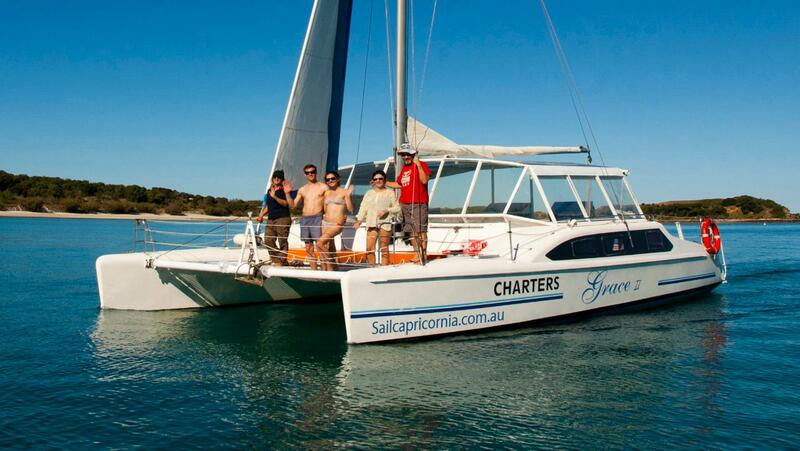 Sail Capricornia's day cruise departs from Keppel Bay Marina and sails to secluded beaches and coves and coral reefs of the beautiful Keppel Islands. Our trip to the islands takes about 1.5 hours and once there you can snorkel, swim, play, eat or just relax and put your feet up while taking in the beautiful surroundings of Keppel Bay. Grace II drops anchor for lunch while her guests snorkel the fringing coral reef, beach-comb, swim or just soak up the Queensland sunshine. The day cruise includes morning tea, buffet lunch with fresh local prawns, afternoon fruit platter, filtered water, soft drinks, tea and coffee (please advise us of any allergies you may have). Guests are welcome to BYO beer, wine and premix alcohol. Snorkeling gear is provided as well as stinger suits and wetsuits in season. Grace II is a sailing catamaran and, as such, the day’s destination is guided by the wind direction and tides.The best island and beaches for the day will be selected depending on the conditions. There are 18 islands in the Keppel group and we visit a few of them throughout the year. Whichever island we visit on your day cruise, you can be assured of beautiful clean beaches, some reef for snorkeling and our lovely clear ocean for swimming.